This article is about the NHL team. For the youth team, see Special Hockey § American teams. Prior to the establishment of the Blue Jackets, the last NHL team in the state of Ohio was the Cleveland Barons, who played from 1976 to 1978. In Columbus, the Blue Jackets replaced the Columbus Chill of the ECHL, who played in the city from 1991 to 1999. The Chill played at the Ohio Expo Center Coliseum where they had an 83-game sellout streak, which was a minor league hockey record at the time. In November 1996, five investors formed a partnership called Columbus Hockey Limited, who then submitted an application and a $100,000 fee to the NHL office. The voters of Columbus were considering a referendum to build a publicly financed arena, a major step toward approval of their NHL bid. When League Commissioner Gary Bettman visited Columbus to meet with the community's leaders about the franchise proposal, there was concern that the voters might not pass the needed referendum. The civic leaders told Bettman that they would not be willing to foot the bill for the team if the referendum failed. However, just after the meeting adjourned, John H. McConnell (one of those who entered the bid) privately guaranteed Bettman that an arena would be built, referendum or not. Columbus' hopes for the bid dimmed when the May referendum failed. However, Nationwide announced on May 31, 1997, that it would finance the $150-million arena. Subsequently, on June 25, 1997, the NHL announced that Columbus would receive a new franchise. Afterwards a "Name the Team" contest was held with the help from Wendy's throughout central Ohio during the month of August 1997. Out of 14,000 submitted entries, the franchise with help from the NHL narrowed the 14,000 entries down to 10 names. Then with the information received from owner McConnell regarding Columbus' history, the League and the franchise narrowed the list of potential names down to two – Blue Jackets and Justice. The former, which referenced Ohio's contributions to the American Civil War, was eventually announced as the team name in November. On June 23, 2000, the NHL's two newest teams, the Blue Jackets and the Minnesota Wild, took part in the 2000 NHL Expansion Draft in Calgary, Alberta. Under the draft's rules, 26 of the NHL's active 28 teams were allowed to protect one goaltender, five defensemen, and nine forwards, or two goaltenders, three defensemen, and seven forwards. The Atlanta Thrashers and Nashville Predators both had their full rosters protected because they were the two newest teams, only being in existence for one and two years, respectively. Both the Blue Jackets and Wild had to use their first 24 selections on three goaltenders, eight defensemen, and thirteen forwards. Their final two picks could be players of any position. With the first-overall choice, the Blue Jackets selected goaltender Rick Tabaracci from the Colorado Avalanche. Over the course of the draft, Columbus picked up goalie Dwayne Roloson, defensemen Lyle Odelein and Mathieu Schneider, and forwards Geoff Sanderson, Turner Stevenson and Dallas Drake, among others. Instead of joining Columbus, Roloson signed with the American Hockey League's Worcester IceCats, Schneider left for the Los Angeles Kings, and the St. Louis Blues signed Drake. Columbus also traded Stevenson to the New Jersey Devils to complete an earlier transaction. The Blue Jackets and Wild were granted concessions by some franchises who could not protect their full rosters. The San Jose Sharks traded Jan Caloun, a ninth-round pick in the 2000 NHL Entry Draft, and a 2001 conditional pick to Columbus; in return, the Blue Jackets agreed not to select the Sharks' unprotected goaltender Evgeni Nabokov. On June 24, at the 2000 NHL Entry Draft, Columbus selected Rostislav Klesla fourth overall. The Blue Jackets played their first regular-season game on October 7, 2000, a 5–3 loss to the Chicago Blackhawks. Bruce Gardiner scored the franchise's first goal. Columbus finished with a 28–39–9–6 record for 71 points, last in the Central Division, and failed to qualify for the playoffs. Geoff Sanderson became the first player in team history to score 30 goals. Ron Tugnutt, who was signed in the summer of 2000, supplied solid goaltending with 22 wins, which tied the 74-year-old League record for wins by an expansion-team goalie (New York Rangers' Lorne Chabot also had 22 wins in 1926–27). Doug MacLean was the general manager for the Blue Jackets from 1998 to 2007, and head coach from 2002 to 2004. The Blue Jackets finished next-to-last in the NHL in the following season, with only 57 points. Ray Whitney, acquired from the Florida Panthers the previous season, led the team in scoring with 61 points, setting a franchise record. Tragedy struck the Blue Jackets organization in March 2002 when 13-year-old Brittanie Cecil was killed after a deflected puck shot by Espen Knutsen struck her in the head while she was in the stands at Nationwide Arena. As a result of her death, large nylon mesh nets were installed behind the goals in all NHL arenas to shield spectators from pucks going over the glass. The team also wore small red hearts with the initials "BNC" on their helmets. During the off-season, the Blue Jackets traded a second-round pick (32nd overall) and Ron Tugnutt to the Dallas Stars. In return, Columbus received Dallas' first-round pick (20th overall) in the 2002 Entry Draft. On the morning of the draft, Columbus traded the third-overall pick and the option to flip draft spots in 2003 to the Florida Panthers; in return, Columbus received the first-overall pick, which they used to select Rick Nash. The 2002–03 season started with Columbus putting up a 7–5–1–1 record after the first 14 games. However, as expectations from their fans grew higher, the team came back to mediocrity, finishing last in the Central Division for the third consecutive season with 69 points and missing the playoffs once again. Dave King, who had been the team's head coach since their debut in 2000, was fired mid-season and replaced by General Manager Doug MacLean. Marc Denis was named starting goalie; he played a franchise-record 77 games that season and set a League record with 4,511 minutes played in 2002–03. He tied for second all-time for games played in a season by a goaltender, just two shy of the League record held by St. Louis Blues' Grant Fuhr in the 1995–96 season. The 2003–04 season was another losing season for the Blue Jackets despite key additions in the off-season. Checking center Todd Marchant was signed to a five-year contract in July from the Edmonton Oilers. Defenseman Darryl Sydor, known to play strong offense as well, was acquired from the Dallas Stars for Mike Sillinger and a draft pick. MacLean stepped aside as head coach midway through the season, giving way to Gerard Gallant. The Blue Jackets finished with just 62 points (the second-lowest total in their short history), but it was enough to help them break out of last place in the Central Division for the first time, finishing ahead of the Chicago Blackhawks. Nash was one of the few bright spots for the team; his 41 goals tied Jarome Iginla and Ilya Kovalchuk for the Maurice "Rocket" Richard Trophy (as League leader in goals scored). In the 2004 off-season, the NHL Players' Association (NHLPA) and NHL administration failed to renew their collective bargaining agreement. September 14, 2004, marked the beginning of the lockout of the 2004–05 season. No games were played and the Stanley Cup was not awarded for the first time since the flu epidemic of 1919. An agreement was made on July 13, 2005, and the lockout officially ended nine days later on July 22, 2005. In the summer of 2005, rugged Colorado Avalanche defenseman Adam Foote agreed to a three-year deal with the team. Heading into the 2005–06 season, it appeared the Blue Jackets would finally take the next step and make the playoffs. Instead, injuries to Rick Nash, Rostislav Klesla and Gilbert Brule, the team's 2005 first-round pick, led to the team putting up a dismal 9–25–1 record through its first 35 games. Superstar Sergei Fedorov was acquired from the Anaheim Mighty Ducks; Anaheim received Tyler Wright and François Beauchemin, and later claimed Todd Marchant off waivers. While again failing to make the playoffs, Columbus did manage to improve. They had the best overtime record in the NHL (14–4) and finished the season with franchise records for wins (35) and points (74). For the first time ever, they earned a third-place finish in the Central Division, behind Detroit and Nashville. Fredrik Norrena in net for the Blue Jackets during the 2006–07 season. 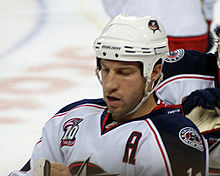 The Blue Jackets acquired Norrena during the 2006 off-season, in a trade with the Tampa Bay Lightning. The 2006–07 season saw several changes made to the team. In the off-season, Marc Denis was dealt to the Tampa Bay Lightning for forward Fredrik Modin and goaltending prospect Fredrik Norrena, making way for Pascal Leclaire to take the starting job. The Blue Jackets also signed Anson Carter when it looked as if Nikolay Zherdev would be playing the season in Russia; in late September, however, Zherdev and General Manager Doug MacLean were able to reach a compromise. Partway through the season, on November 13, 2006, Gerard Gallant was relieved of his duties as head coach. The next day, Gary Agnew was named his interim replacement. On November 22, Ken Hitchcock, former coach of the Dallas Stars and Philadelphia Flyers, was named the new head coach, effective the following day. Under Hitchcock's first year, two milestones were set: on December 10, 2006, the Blue Jackets scored a team-record five power-play goals in a 6–2 win over the Ottawa Senators, and on April 3, 2007, the Blue Jackets broke the modern-day record for most times being shut-out in a season (16) with a 3–0 loss to the Detroit Red Wings. 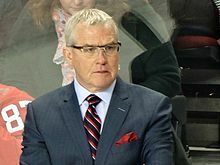 On April 18, 2007, Doug MacLean, the team's first general manager and president, was fired after nine years and six seasons at the helm without a playoff berth. Mike Priest, President of Blue Jackets parent company JMAC, Inc., was named President of the club, while Assistant General Manager Jim Clark served as general manager until the Blue Jackets named Edmonton Oilers Assistant General Manager Scott Howson as the new general manager on June 15, 2007. On October 4, 2007, the Blue Jackets announced their affiliation with the Elmira Jackals, which replaced their former affiliation with the Dayton Bombers as the club's ECHL affiliate. The 2007–08 season, the club's first full season under Hitchcock, started off well as the Jackets got off to their best start in franchise history, starting with a 4–0 shutout of the defending Stanley Cup champion Anaheim Ducks. At the trade deadline on February 26, 2008, however, apparently unable to agree on a new contract and amid some controversy, Blue Jackets captain Adam Foote requested a trade to the Colorado Avalanche, which was granted. The Blue Jackets received a pair of conditional picks in return. A few weeks later, on March 12, 2008, former Blue Jackets number-one draft pick Rick Nash was named the new team captain. Despite this, Columbus managed its best season record to date, staying above a .500 game wins average until the very last game of the season and finishing fourth in the Central Division with 80 points. After the season, Nash was announced as the cover player for the NHL 2K9 video game by Take-Two Interactive. At the 2008 NHL Entry Draft, the Blue Jackets selected Nikita Filatov with the sixth overall pick. They also traded away the 19th overall pick (acquired from the Colorado Avalanche in exchange for Adam Foote) for R. J. Umberger. The Blue Jackets made many trades in the 2008 off-season. Gilbert Brule was traded to the Edmonton Oilers for Raffi Torres. Enigmatic forward Nikolay Zherdev and Dan Fritsche were traded to the New York Rangers in exchange for defensemen Fedor Tyutin and Christian Backman. The Blue Jackets also signed free agents Kristian Huselius and Mike Commodore to multi-year contracts. On July 9, 2008, the Blue Jackets announced they signed Hitchcock to a three-year extension to remain as head coach. Named captain on March 12, 2008, Rick Nash served as the team's captain until he was traded to the New York Rangers on July 23, 2012. During the 2008–09 season, the Blue Jackets made two trades which greatly played to their benefit. Forward Jason Williams was acquired from the Atlanta Thrashers in exchange for defenseman Clay Wilson and a sixth-round draft pick. The Blue Jackets were also involved with the first major deal of the 2009 NHL trade deadline, by trading goaltender Pascal Leclaire and a second-round draft pick to the Ottawa Senators for skilled center Antoine Vermette. The changes in scenery benefited both players and the Jackets; Williams scored 28 points in his first 36 games as a Jacket, while Vermette scored 11 points in his first 14 games with the team. Rick Nash scored 79 points throughout the season, setting a franchise record. On April 8, 2009, the Columbus Blue Jackets secured the first Stanley Cup playoff berth in the franchise's eight-year history with a 4–3 shootout win over the Chicago Blackhawks. However, they were swept in the first round by the Detroit Red Wings in four games, and would not qualify for the playoffs for the next four seasons. With 21 games remaining and sitting four points out of eighth in the Western Conference, the Blue Jackets dealt long time defenseman Rostislav Klesla and Dane Byers to the Phoenix Coyotes in exchange for Scottie Upshall and Sami Lepisto at the trade deadline on February 28, 2011. In the 2011 off-season, in an attempt to make a serious playoff run, the Blue Jackets traded Jakub Voracek, their 2011 first round pick (Sean Couturier) and a third round pick (Nick Cousins) to the Philadelphia Flyers for All-Star center Jeff Carter. They also signed several free agents: James Wisniewski, Vaclav Prospal and Radek Martinek. However, after a disastrous start to the 2011–12 season that saw the firing of head coach Scott Arniel, Carter was traded to the Los Angeles Kings for Jack Johnson and a conditional first round pick after playing just 39 games with the Blue Jackets. The Blue Jackets also traded veteran centers Antoine Vermette and Samuel Pahlsson for goaltender Curtis McElhinney and several draft picks at the trade deadline. There was also heavy speculation that captain Rick Nash would be traded at the deadline. Although Nash wasn't traded, General Manager Scott Howson publicly announced that he had privately requested a trade, a move that has stirred up much controversy. Nash was eventually traded to the New York Rangers on July 23, 2012, for Brandon Dubinsky, Artem Anisimov, prospect Tim Erixon and a 2013 first-round draft pick. At the 2012 NHL Entry Draft, the Blue Jackets traded their second and fourth round picks to the Philadelphia Flyers for the eventual winner of the 2013 Vezina Trophy, goaltender Sergei Bobrovsky. The 2012–13 lockout and season saw changes to the executive and front office of the organization. John Davidson was named as president of hockey operations for the Blue Jackets on October 24. On February 12, Scott Howson was relieved of his duties as general manager. Jarmo Kekalainen, who had previously worked with Davidson in St. Louis, was hired away from Jokerit of the Finnish SM-liiga to be the new general manager becoming the first European born general manager in the NHL. The Blue Jackets then traded for All-Star forward Marián Gáborík. The Blue Jackets just missed the playoffs via a tiebreaker against the Minnesota Wild, who had more regulation and overtime wins (ROW). Nathan Horton during the 2013–14 season. As a result of a postponed game, Horton became the only player in NHL history to have registered a goal, without suiting up for that game. The Blue Jackets moved into the Metropolitan Division of the Eastern Conference in the 2013–14 season after spending its first 13 seasons in the Central Division of the Western Conference. The other teams in the Metropolitan Division consist of the Carolina Hurricanes, New Jersey Devils, New York Islanders, New York Rangers, Philadelphia Flyers, Pittsburgh Penguins and Washington Capitals, the latter six of which once composed the old Patrick Division. On April 9, 2014, the Blue Jackets clinched their second playoff spot in franchise history by winning a 3–1 game against the Dallas Stars. This game was also noted for being a game resumed after being postponed on March 10, 2014, due to Rich Peverley's cardiac event in which the Blue Jackets led 1–0. The NHL decided to keep the goal scored by Nathan Horton and resumed the game with a full 60 minutes. 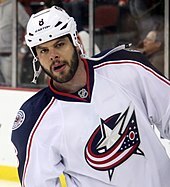 Nathan Horton made history by being credited for scoring a goal while not suiting up for the game. The Blue Jackets faced the Pittsburgh Penguins in the first round (Eastern Conference Quarter-finals) of the 2014 Stanley Cup playoffs. This series had a trend that was noted for making 3–1 leads end up as 4–3 loss. Game 1 and 2 were at the Consol Energy Center in downtown Pittsburgh. The Blue Jackets made a large jump in history when Jack Johnson scored the first goal of the game. This was the first time in franchise history that Columbus ever lead a post-season game. The Jackets lead the game 3–1 at one point from goals by Mark Letestu and Derek MacKenzie. However, the Penguins rallied to win it 4–3. Game 2 was the opposite. Pittsburgh led 3–1 at one point, but Columbus rallied to win Game 2 4–3 by an overtime goal from Matt Calvert. This was the first playoff victory in franchise history. Pittsburgh won Game 3 by a score of 4–3. Game 4 was a memorable night at Nationwide Arena. Columbus was down 3–0, and 3–1 by the end of the first period. Boone Jenner and Ryan Johansen scored to make it 3–2 by the end of the second period. Brandon Dubinsky scored the game tying goal with 22.5 seconds left in regulation, after a miss-play with the puck by Marc-Andre Fleury. Nick Foligno went on to score the game-winning goal in overtime. In the locker room during intermission, he supposedly told the team that he will score the game winner. Pittsburgh, however, went on to win the next two games and took the best-of-seven series in six games. The 2014–15 season was most notable for the amount of injuries the Jackets incurred. The Jackets lead the league in man games lost with 502. At one point, the injured reserve list consisted of 15 players, including stars Sergei Bobrovsky, Brandon Dubinsky, Jack Johnson, and Ryan Murray. When the team's injured players began to return in late February, they were able to accumulate wins the way they had the previous two seasons and in the process, set a franchise record earning nine consecutive wins. However, the Blue Jackets still finished fifth in the Metropolitan Division and missed the playoffs by nine points despite a 42-35-5 record. On May 20, 2015, Nick Foligno was named the sixth captain in team history. The position had been vacant since Rick Nash was traded to the New York Rangers in July 2012. On June 30, 2015, the Jackets traded centers Marko Dano and Artem Anisimov, along with wingers Jeremy Morin and Corey Tropp, to the Chicago Blackhawks for Brandon Saad. This move was the subject of much controversy in Chicago since Blackhawks General Manager Stan Bowman had publicly said that Saad was going to be a part of the organization for many years to come. The Jackets also acquired Michael Paliotta and Alex Broadhurst in the trade. The Jackets signed center Gregory Campbell from the Boston Bruins a few days later. The Blue Jackets initially went into the 2015–16 season with high expectations. However, the team got off to an inauspicious start by losing their first eight regular season games in regulation. This prompted the Jackets to fire head coach Todd Richards and hire John Tortorella in his place. On January 6, 2016, the Blue Jackets traded Ryan Johansen to the Nashville Predators in exchange for defenseman Seth Jones. The Blue Jackets record at the end of the season was 34–40–8, and were ranked 27th overall in the NHL. They closed out the season on a high note, however, as they won the season finale against the defending Stanley Cup champion Blackhawks, overcoming a 3–0 deficit after the 1st period to win 5–4 in overtime. Sergei Bobrovsky was awarded his second Vezina Trophy for his performance in the 2016–17 season. The Blue Jackets set three franchise records during the 2016–17 season. On November 4, 2016, the Blue Jackets scored a franchise-record ten goals in a 10–0 shutout win against the Montreal Canadiens, becoming the first team to do so since 2011 (when the St. Louis Blues beat the Detroit Red Wings 10–3). In mid-November, the Blue Jackets got a franchise record seventh consecutive win at home. During a franchise-record 16-game win streak that started in late November, Tortorella recorded his 500th career win in a 4–3 Blue Jackets overtime win on the road against the Vancouver Canucks, becoming the first American-born head coach to reach 500 wins. The team had a record of 14–0–0 in December. The team's win streak ended in early January when they lost 5–0 to the Washington Capitals. The win streak was the second longest in NHL history behind the 1992–93 Pittsburgh Penguins' 17 consecutive games. The team finished with a record of 50–24–8 and 108 points, setting a franchise record. During the first round of the 2017 playoffs, the Blue Jackets were placed in a matchup against the Pittsburgh Penguins. The team lost three straight games to begin the series, but won the fourth game to save themselves from elimination. This game in which they won 5-4 marked the Blue Jackets first regulation win in the Stanley Cup Playoffs. Despite this, they would ultimately lose the series in five games. In the following off-season, on June 23, 2017, the Jackets made another deal with the Blackhawks sending Brandon Saad back to Chicago for Artemi Panarin and Tyler Motte. The Blue Jackets returned to the playoffs in 2018 as a wild card qualifier, going in back-to-back years for the first time. There they faced the Metropolitan Division champion Washington Capitals in the first round, winning the first two games in overtime and their first series lead. However, they lost the next four games and the series in six games. The Blue Jackets returned to the playoffs the following year, where they swept the Tampa Bay Lightning in the first round, to win their first ever playoff series. The name "Blue Jackets" was chosen to celebrate "patriotism, pride, and the rich Civil War history in the state of Ohio and city of Columbus." When President Abraham Lincoln requested that Ohio raise ten regiments at the outbreak of the Civil War, the state responded by raising a total of 23 volunteer infantry regiments for three months of service. Ohio also produced a number of great Civil War figures, including William Tecumseh Sherman, Ulysses S. Grant, Philip Sheridan and George Custer. Columbus itself was host to large military bases, Camp Chase and Camp Thomas, which saw hundreds of thousands of Union soldiers and thousands of Confederate prisoners during the Civil War. The team logo is a stylized version of the flag of Ohio, which is a burgee (i.e. swallowtail pennant), in the form of a "C" wrapped around a star, representing both patriotism and Columbus's status as state capital. Previously used as an alternate logo starting in 2003, it became the primary logo as part of a Reebok-sponsored redesign for the 2007–08 season. The original logo had a red ribbon with 13 stars representing the 13 Colonies, unfurled in the shape of the team's initials, CBJ, with an electric gold hockey stick cutting through the center to represent the "J." An additional star atop the stick represented Columbus's status as state capital. From 2003 to 2015, the team's jerseys featured an alternate logo, a Civil War cap with crossed hockey sticks, on the shoulders. The Blue Jackets unveiled a new third jersey in the 2010–11 season, using a vintage hockey jersey design. In the spirit of its Civil War theme, it sports a union blue base with white stripes on the sleeves and on the shoulder padding. 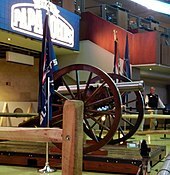 The crest features the team's Civil War-era cannon. It honors the team's founder, John H. McConnell, with his initials on the neckline, as well as its slogan "We fight, we march!" on the inside of the collar. During the 2015 NHL Draft, it was revealed that the cannon crest had replaced the hat logo on the shoulders of the home and away jerseys, with a color change to match the jerseys' color scheme. The alternate logo for the franchise from 2000 to 2003. A replica 1857 Napoleon is "fired" at Nationwide Arena as the Blue Jackets take the ice, when they score, and when they have won the game. It was fired 164 times in its inaugural season (41 home games, 20 home victories, 103 goals scored at home). When the Blue Jackets score a goal, the title line of "For Those About to Rock (We Salute You)" by AC/DC is played when the cannon is fired followed by the chorus of "The Whip" by Locksley. On Fox Sports Ohio, Jeff Rimer serves as the television play-by-play announcer alongside former Blue Jacket Jody Shelley providing color analysis. Rimer started calling games on television in 2005 with Shelley joining Rimer in 2014–15 replacing previous analyst Bill Davidge. Blue Jackets Live, the televised pre-game, intermission and post-game shows are hosted by Davidge and Brian Giesenschlag. In-game reporting is provided by Dave Maetzold. On radio stations WBNS-FM (flagship), WBNS, WWCD, and 34 other affiliates in Ohio and West Virginia, Bob McElligott provides play-by-play coverage. McElligott joined the Blue Jackets radio broadcast in July 2009 as a color analyst and became the play-by-play analyst for the 2013–14 season, taking over for George Matthews who had been calling Blue Jackets games since the team's inception in 2000. McElligott, along with Ryan Mitchell, hosts the pre-game and post-game radio shows. Fans can interact by e-mail and Twitter with McElligott and Mitchell during and after the game. Stinger is the official mascot of the Blue Jackets. Stinger is a 6-foot 9-inch bright green bug that walks amongst the crowd during the games and skates on the ice between periods while wearing a Blue Jackets jersey. Stinger was originally yellow, but was changed to green, eventually mixing with the team's blue. The image of Stinger was on the original Blue Jackets jerseys, eventually being removed in 2003. The team also had another mascot, an anthropomorphic cannon named Boomer, for half of the 2010–11 season. Other than 99, which was retired league-wide to honour Wayne Gretzky in February 2000, there are no retired Blue Jacket numbers. a The Blue Jackets acquired the first overall pick from the Florida Panthers for the third overall pick (Jay Bouwmeester) and the option to swap 2003 first round draft picks (not exercised) on June 22, 2002.
b The Blue Jackets acquired the eighth overall pick along with the 59th pick (Kyle Wharton) from the Carolina Hurricanes for the fourth overall pick (Andrew Ladd) on June 26, 2004.
c The eighth overall pick (Sean Couturier) along with the 68th pick (Nick Cousins) was traded to the Philadelphia Flyers for Jeff Carter on June 23, 2011.
d The Blue Jackets acquired the 29th overall pick from the Toronto Maple Leafs for the 34th and 68th picks on June 26, 2015. Recording 250 points with the Blue Jackets, R. J. Umberger is the fifth-highest franchise point leader. These are the top ten point-scorers in franchise history as of the 2018–19 season. David Savard set the franchise record for highest plus/minus of +33 during the 2016–17 season. ^ "Team Quick Facts" (PDF). 2018–19 Columbus Blue Jackets Media Guide. NHL Enterprises, L.P. September 24, 2018. Retrieved April 19, 2019. ^ "Columbus Blue Jackets Logo Style Guide" (PDF). NHL Enterprises, L.P. July 17, 2015. Retrieved September 17, 2015. ^ "Our Founder: John H. McConnell". ColumbusBlueJackets.com. NHL Enterprises, L.P. Retrieved December 21, 2018. ^ a b c "Blue Jackets History". Columbus Blue Jackets. Retrieved July 24, 2008. ^ "First is best: Jackets finally heading to playoffs". ^ "Blue Jackets, Cleveland's Lake Erie Monsters announce multi-year AHL affiliation agreement". Columbus Blue Jackets Official Website. Columbus Blue Jackets. Retrieved April 17, 2015. ^ Minium, Harry (January 14, 1997). "With Arena Deal in Hand, Underdog Shinn May Have An Advantage". The Virginian-Pilot. Archived from the original on December 5, 2008. Retrieved May 20, 2008. ^ Miller, Rusty (May 7, 2008). "Public memorial honors Blue Jackets owner McConnell". Associated Press. Retrieved June 19, 2008. ^ a b c d "Naming a Team: The Story Behind the Blue Jackets Name". ^ "The ins and outs of the Expansion Draft". ESPN. June 13, 2000. Retrieved June 19, 2008. ^ "Blue Jackets fill roster in expansion draft". ESPN. June 23, 2000. Retrieved June 19, 2008. ^ "Blue Jackets, Wild stock rosters, deal". Associated Press. June 24, 2000. Retrieved June 19, 2008. ^ Shactman, Brian A. (August 18, 2000). "A Closer Look: Los Angeles Kings". ESPN. Retrieved June 19, 2008. ^ Lapointe, Joe (June 24, 2000). "In Expansion Draft, Devils Emerge With a Gain of One". The New York Times. Retrieved June 19, 2008. ^ "Blue Jackets sign Caloun, Nummelin". CBC Sports. November 10, 2000. Retrieved June 19, 2008. ^ Chi, Victor (June 12, 2000). "Sharks protect goaltender from expansion teams". San Jose Mercury News. Retrieved June 19, 2008. ^ "2000 Entry Draft". National Hockey League. Archived from the original on May 13, 2008. Retrieved June 1, 2008. ^ Shea, Kevin (August 18, 2003). "Stanley Cup Journal: 31". HHOF. Archived from the original on December 3, 2010. Retrieved June 19, 2008. ^ a b c "Blue Jackets fire MacLean as president, GM". CBC Sports. April 19, 2007. Retrieved June 20, 2008. ^ Beech, Mark (October 8, 2001). "SI's 2001–02 NHL Team Previews: Blue Jackets". Sports Illustrated. Retrieved June 19, 2008. ^ "2001–02 National Hockey League (NHL) standings". Archived from the original on May 31, 2008. Retrieved June 19, 2008. ^ "New Faces Give Fresh Hope to Blue Jackets in Third Season". Associated Press. September 13, 2002. Retrieved June 3, 2008. ^ Foltman, Bob (June 20, 2002). "NHL Teams to Install Netting Around Each Goal to Prevent Fan Injuries". Chicago Tribune. Retrieved June 3, 2008. ^ "Family, Blue Jackets honor Brittanie Cecil at Funeral". Associated Press. March 24, 2002. Retrieved June 3, 2008. ^ Carlton, Chuck (June 18, 2002). "Stars Get Veteran Tugnutt in Trade". The Dallas Morning News. Retrieved June 3, 2008. ^ Heinen, Laurence (June 22, 2002). "Consensus top pick drops to third". Retrieved June 3, 2008. ^ "Columbus Blue Jackets 2003–04 Schedule". ESPN. Retrieved June 3, 2008. ^ "2002–03 Standings". National Hockey League. Archived from the original on March 5, 2016. Retrieved June 16, 2008. ^ "Blue Jackets Hire King as Coach, Dave King Becomes Team's First Coach". Associated Press. July 5, 2000. Retrieved June 2, 2008. ^ Burnside, Scott (January 4, 2004). "Mediocre would be improvement". ESPN. Retrieved June 2, 2008. ^ Gannam, Tom (June 12, 2003). "Fuhr, LaFontaine picked for Hockey Hall of Fame". USA Today. Retrieved June 16, 2008. ^ "Mighty Ducks Acquire Center Marchant from Columbus". ESPN. November 21, 2005. Retrieved July 24, 2008. ^ "MacLean Resigns as Blue Jackets Coach, Remains GM". Associated Press. January 1, 2004. Retrieved June 3, 2008. ^ a b "Richard Trophy winners". Associated Press. April 4, 2004. Retrieved June 18, 2008. ^ Brink, Graham (June 5, 2004). "Injuries sideline players only rarely". St. Petersburg Times. Retrieved June 17, 2008. ^ "Foote's three-year deal reportedly worth $13.8 million". Associated Press. August 3, 2005. Retrieved June 20, 2008. ^ "Columbus Blue Jackets 2005–06 Schedule". ESPN. Retrieved June 20, 2008. ^ "2005–06 Regular Season Standings". National Hockey League. April 19, 2006. Retrieved November 11, 2016. ^ Jones, Tom (June 30, 2006). "Lighnting gets № 1 goalie". St. Petersburg Times. Retrieved June 20, 2008. ^ Allen, Kevin (September 13, 2006). "Blue Jackets, with eye on Zherdev, sign veteran Carter; Flyers GM Clarke angry". USA Today. Retrieved June 20, 2008. ^ "Zherdev finally signs with Blue Jackets". Associated Press. September 29, 2006. Retrieved June 20, 2008. ^ "Former Flyers Coach Hitchock Is Hired to Guide Blue Jackets". Associated Press. November 23, 2006. Retrieved June 20, 2008. ^ "Blue Jackets beat Senators 6–2". Associated Press. December 11, 2006. Archived from the original on October 23, 2008. Retrieved June 20, 2008. ^ "Elias Says..." ESPN. April 3, 2007. Retrieved June 20, 2008. ^ "Mike Priest, Managing Board Member". Columbus Destroyers. Archived from the original on October 23, 2008. Retrieved June 20, 2008. ^ "Blue Jackets Name Scott Howson General Manager" (Press release). Columbus Blue Jackets. June 15, 2007. Archived from the original on July 2, 2007. Retrieved June 15, 2007. ^ Juniewicz, Debbie (October 6, 2007). "Bombers lose Blue Jackets affiliation". Dayton Daily News. Retrieved June 20, 2008. ^ Arace, Michael (March 1, 2008). "Something stinks with Foote's story on staying put". The Columbus Dispatch. Archived from the original on May 23, 2011. Retrieved June 8, 2008. ^ a b "Rick Nash Named Columbus Blue Jackets Team Captain" (Press release). Columbus Blue Jackets. March 21, 2008. Archived from the original on March 13, 2008. Retrieved June 18, 2008. ^ "Risebrough, Lemaire hear call of Wild". Canwest News Service. May 16, 2008. Archived from the original on December 5, 2008. Retrieved June 20, 2008. ^ "Hitchcock signs three-year extension as Blue Jackets' coach". Associated Press. July 9, 2008. Retrieved July 9, 2008. ^ "Blue Jackets clinch first playoff spot". Associated Press. March 9, 2009. Retrieved March 10, 2009. ^ "Scott Howson Tosses Rick Nash Under the C-Bus". Retrieved March 23, 2012. ^ "By Calling Out Rick Nash, Scott Howson May Have Written Own Ticket Out of Columbus". Retrieved March 23, 2012. ^ "Nash traded to Rangers in five-player deal". ^ "Blue Jackets: Davidson hired to win". The Columbus Dispatch. Archived from the original on April 13, 2014. ^ "Blue Jackets fire GM Scott Howson". ESPN. February 12, 2013. ^ "Blue Jackets GM fired; new one at hand?". Archived from the original on April 2, 2015. Retrieved March 3, 2015. ^ "Realignment plan approved by Board of Governors". ^ "Official Columbus Blue Jackets Website". ^ "Nathan Horton Could Make NHL History By Not Playing Against Stars". April 8, 2014. ^ "Blue Jackets rout Canadiens in record-setting win". Sports Illustrated. November 4, 2016. Retrieved November 9, 2016. ^ Mixer, Rob (December 19, 2016). "Tortorella's 500th win special for entire team". National Hockey League. Retrieved January 6, 2017. ^ Rogers, David (December 31, 2016). "The Blue Jackets didn't lose in December, have the second-longest single-season win streak – Puck Drunk Love". Puck Drunk Love. Retrieved January 4, 2017. ^ Khurshudyan, Isabelle (January 5, 2017). "Streak busters: Caps end Blue Jackets' run with 5-0 rout". The Washington Post. Retrieved January 6, 2017. ^ "Blue Jackets History Timeline". Columbus Blue Jackets. Archived from the original on July 10, 2007. Retrieved July 25, 2007. ^ "Jackets unveil new uniforms". Archived from the original on September 7, 2012. ^ "Making sense of the NHL's new uniforms". The Canadian Press. September 25, 2007. Archived from the original on June 22, 2008. Retrieved June 20, 2008. ^ "Columbus Blue Jackets, Fox Sports Ohio Announce Changes to Television Broadcast Team". Columbus Blue Jackets. Retrieved May 30, 2014. ^ "Fan Zone". Columbus Blue Jackets. Retrieved June 9, 2015. ^ "Columbus Blue Jackets Television – Columbus Blue Jackets – Multimedia". Columbus Blue Jackets. Retrieved November 7, 2009. ^ "Radio Web Page – Columbus Blue Jackets – Multimedia". Columbus Blue Jackets. Retrieved November 7, 2009. ^ "Columbus Blue Jackets' Second Team Mascot,". ^ "Best Short-lived Mascot: The Columbus Blue Jackets' Boomer". ^ "Columbus Blue Jackets Roster". NHL.com. Retrieved October 3, 2017. ^ "Columbus Blue Jackets Hockey Transactions". TSN.ca. Retrieved October 3, 2017. ^ "Veteran defenseman signs 1-year deal". SportsTicker. September 9, 2003. Retrieved June 18, 2008. ^ Amber, David (January 4, 2007). "Ray Whitney... former stick boy, current Cup champ". ESPN. Retrieved June 20, 2008. ^ "Richardson removes 'C' from Blue Jackets sweater". Associated Press. November 29, 2005. Retrieved June 18, 2008. ^ "Blue Jackets activate Foote from injured list". Associated Press. December 9, 2005. Retrieved June 18, 2008. ^ "Blue Jackets name Nick Foligno team captain". Columbus Blue Jackets. May 20, 2015. Retrieved May 20, 2015. ^ "NHL.com – Statistics". National Hockey League. Retrieved April 17, 2019. ^ a b Whyno, Stephen (April 16, 2018). "'Bread' is the man in playoff surge for the Blue Jackets". USA Today. Retrieved April 19, 2018. ^ "Rick Nash Official Player Page". National Hockey League. Archived from the original on June 23, 2008. Retrieved June 18, 2008. ^ a b "Cam Atkinson". April 10, 2017. Retrieved April 10, 2017. ^ "Jody Shelley". National Hockey League. Archived from the original on April 25, 2006. Retrieved July 24, 2008. ^ "David Savard". April 10, 2017. Retrieved April 10, 2017. ^ "Pierre-Luc Dubois". June 8, 2018. Retrieved June 8, 2018. ^ "Sergei Bobrovsky". April 10, 2017. Retrieved April 10, 2017. ^ "Steve Mason". March 26, 2009. Retrieved March 26, 2009. Wikimedia Commons has media related to Columbus Blue Jackets.